I've collected a handful of Catrice Ultimate Colour Lipsticks to review, dating back from my first haul in June. I don't like to review products of any kind unless I feel like I've used them enough. Suffice to say, a year is a good amount of time to use products. Just like its sister brand Essence, Catrice is a hit-or-miss brand. Their mascaras are a dream but their eyeliners are crap. Their foundations are amazing but their concealers are horrid. They are either the best or the worst products on a budget. Their lipsticks are no different. Thank goodness, their Ultimate Colour collection is fantastic. An orange-peachy lipstick that baffles me, being my least favourite in the collection. Princess Peach is a coral shade with a warm undertone and a creamy finish. Wearing this lipstick gives the illusion of tanner skin which many fancy but not me. While it is still opaque, I found this one to be the most sheer and looks messy and muddy. However, blotting tissues would clear that right up. This lipstick works best on those with darker skin as a bright pop of orange for a warm Summer Day. If Nicki Minaj made a lipstick for Barbie, it would be Pinker-bell. Bright, loud, and fun, Pinker-bell is a strong fuchsia pink with specks of glitter. It has a shiny and glossy finish that gives your lips an almost purple/blue glow. It's definitely a 'look at me, I'm so exciting!' colour in the best way possible. Eye-catching and attention-seeking, and almost perfect. Almost. Due to the finish, it lacks in longevity and smudges easily. My absolute favourite shade from the entire collection. I use it so often that it's almost finished. Tell Me A Berry-Tale is a deep plum berry shade that blurs the line between red and purple perfectly. It's dark, brooding, and absolutely fantastic. This lipstick would suit everyone, from dark to tan to light. Dark purples suit everyone, even if it may seem a little scary. If you want a purple lipstick that isn't too dark for the day, it works just as nice as a stain. The most recent addition to my growing collection. Just like the name implies, MATTraction has a matte finish. It's a gorgeous dark rosy-pink with a cool red undertone that looks nothing like the the tube it came out of. It lasts the longest among the rest, at almost four hours without reapplication. It's perfect for both day and night wear for any season. It's makes me feel classy and fancy, even though I have neither. The formulas for these lipsticks in the Ultimate Colour collection are incredible. Creamy, thick and rich in pigment. With proper application, they can last a relatively long time from two to four hours before fading. With that said, due to its creaminess, it has the tendency to bleed and smudge. Not as bad as other lipsticks I've tried though. A lipliner is not required, but rather recommended. At BND$4.90, these lipsticks are a steal! With a wide range of colours suitable for any skin tone, these are definitely lipsticks for those on a budget. I'll be picking up a few more soon just because I love the collection too much. So have you used Catrice lipsticks before? What do you think? Each shade is gorgeous! Such a creative review! love it! Ooh, they look so good on you, Bash! Pink Bell makes you glow, and you look absolutely radiant in all these shades! ALSO, girl, your skin is amazing! Skincare Routine post ASAP! Where did you get these in Brunei, though? I may have to get my hands on them! I actually thought that princess peach suits you best out of them all! I have heard loads about Catrice yet I've never tried any of their products. The colours from this collection are gorgeous though ! the pinker-bell one looks adorable! The dark rosey one looks like it was made for you. Dang girl. Catrice definitely do a bunch of great lipcolours! You're so gorgeous!! Every shade suits you, I'm very jealous of your skin you look amazing. Ahhh how is it that you look great in every shade? Love your hairstyle as well! 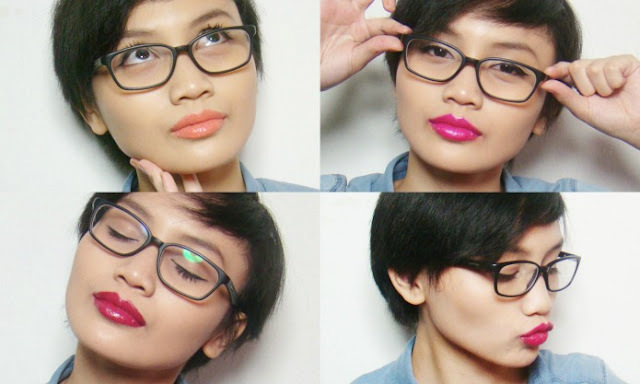 Oh my goodness, these lipsticks look amazing on you! You are stunning :) Thanks for such an honest review. I love that first one on you! All those shades are so beautiful! I love how moisturizing and pigmented they look! all of the shades look great on you! Great review darling! Love these colors!! That princess peach suits you well. Great review! I love the MATTEtraction colour, it looks great on you. These all look so lovely! Pinker bell is my favourite colour, i love bright one's. It looks great on you as well. Love this review!! I actually love them all! Love your post. Have a great day, dear! These shades look great on you! I love bright lipsticks so my faves are the bright ones :) But all are so nice! I love the princess peach shade! Ooh all these shades look lovely on you. It's a shame that you liked Princess Peach the least, as it really suits you, but I can understand if it's difficult to work with. I've never heard of Catrice before, I'm not even sure if they're available in the UK. I swear you can basically pull of every color. I have to say that the first one - the coral color is my favorite. love the pink one! but to be honest they all suits you well! Yay for the lipsticks being a hit! I actually really love all of the shades, but my fave has to be MATTraction - it really suits you! I love your photos by the way! Seriously, SO cute! Love it!! I just love these colors on you. I've never heard of this brand. Thanks for posting about this. Whatttt?! You have Catrice in Brunei?! Dammit, we don't have it here in Canada! :-( Pinker-bell is my favourite out of the 4, stunning and bold! Like all four colour! Nice post! Thanks a lot to visit my blog! Love the princess peach one. Pinker-bell is such a lovely colour and I really love that name too! I have never heard of this brand of lipstick before but I always love getting new lipsticks! Honestly, all of the colors looked amazing on you. My favorite one was the bright pink though! I just wore a Maybelline bright pink today and am kind of obsessed with it right now :) Thank you for your reviews! totally love the bright pink one!! These colors look great on you! I really adore the pink one... It's incredible how lipstick creates different styles! I love the orange, Catrice is my fav brand too. Ooh loving these gorgeous colors! They look amazing on you!! Amazing shades! They are all so beautiful, I can't choose! Love the pinker bell shade! Wow! Pinker bell is amazing!!! These are all so lovely on you! I wish I was that photogenic haha! I love the Tell Me A Berry-Tale shade the most. Great review! I like all of these on you!! MATTraction is such a gorgeous colour especially. Great review, wish we had Catrice here to try! All of these lipsticks suit you so much, you look gorgeous! These are such lovely strong colour, and the pigmentation looks just great! These shades are beautiful and i've heard a lot about catrice!! I love the peach one the best its gorgeous! Wow, you are so cute! I love 360 and 160! They look really good on you! So glad I found your blog! Love it! Really difficult! I love every single lipstick color! They all match perfectly with your skin tone! Thank you so much for sharing! I've never heard of the brand but I have used essence products before. The matte one is my favorite! It's a bummer that the orange didn't apply the way you wanted it to because the color looks great on you! Gorgeous shades but peach princess looks adorable on you!! These lipsticks all look so great. I have never heard of this brand before, Thanks for sharing this post.